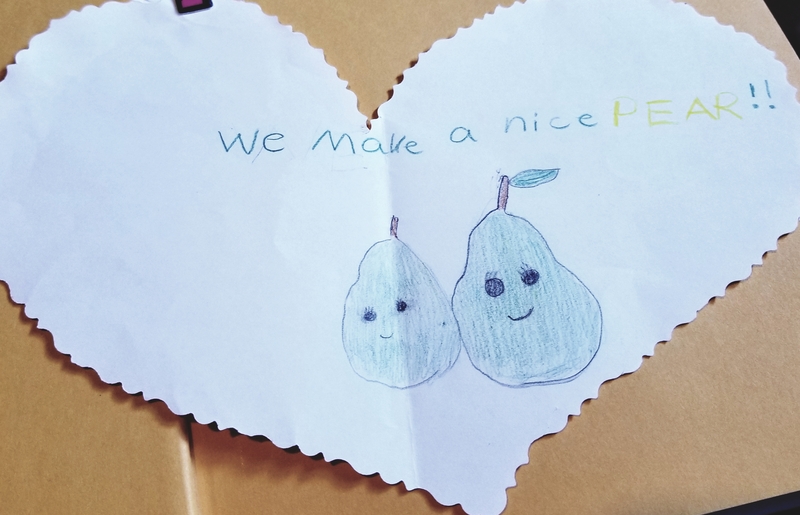 We Make a Nice Pear! My daughter made this for me for Valentine’s Day this year. Isn’t it sweet? I have always loved pears and as a child they were my favorite fruit. My Dad would come home with cases of them after negotiating with the produce manager at the grocery store who was looking to move along the fruit that was bruised or getting too ripe to sell. It was a delight for us and to this day it is a fond memory of mine. Knowing what I know now about nutrition and the healing powers of fruit, I am especially grateful that my parents instilled in us the importance of eating fruits and vegetables as well as feeding them to us when the budget allowed. A priority was always made by my mother to make sure the food had the highest nutrient content possible considering that we did not have a lot of resources and lived in a very remote area, quite isolated from food sources. In fact, those cases of pears I talked about in my childhood were brought home either by boat in the summer or snowmobile in the winter, on top of a long drive from the city. Pears are loaded with phyto-nutrients such as trace minerals, and amino acids such as valine, histidine, threonine and lysine. They are also loaded with vitamins and minerals. The trace mineral salts make pear juice high in electrolytes which help to stabilize blood sugar. Try incorporating more fruits into your daily routine. They are one of, if not the most healing foods on earth. The natural sugars in fruit are important for your liver and brain as well. In fact, if you find yourself craving foods such as carbs, chocolate, alcohol or even cigarettes, try increasing your uptake of fruit so your body gets the natural sugars that it so desperately needs and craves. Maggie Holbik.com is a Certified Holistic Nutritionist and Life Coach who resides in Northern Ontario Canada.